The best hearing protection devices (HPDs) protect you from permanent loss of hearing. HPDs are essential for noisy work sites, at-home tasks, or recreational activities. Adequate protection in all hazardous noise circumstances prevents damaging levels of noise from reaching your inner ear. The following is a selection of the best consumer-rated hearing protection devices of various types and prices, and are suitable for a range of hazardous noise conditions. ClearArmor 141001 Safety Ear Muffs are rated by Shooting & Safety as one of its top earmuffs for gun shooting noise protection. They can also be used for a range of other activities, such as auto racing, yard work, loud music, and construction work. Reviewers on Amazon also give this product excellent ratings for its light-weight comfort and noise reduction. It is compact and weighs 9.4 ounces and has one of the highest NRR of 34. The ear cups are foldable and are attached to an adjustable, padded headband that provides a snug fit. The affordable, regular retail price is about $30 on Amazon. The 3M Peltor Sound-Trap Slim Line Electronic Earmuff was given a 2013 Brilliance Awards by Optics Planet as a top consumer choice. 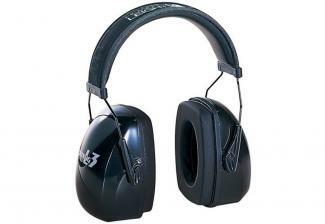 Reviewers rate these highly for their great noise protection, compact style, and foldable ear cups. The slimline ear cups of this earmuff adapt well to long gun/rifle shooting and have built-in electronics with volume control in each cup to reduce unwanted loud noise and amplify low sounds. The product has an NRR rating of 20 and is recommended for military and tactical use and sells for about $120 on Optics Planet. The Howard Leight Leightning L3 Earmuffs gets 4.7 out of 5 stars from reviewers on Midway USA. The product gets excellent reviews for quality and "best hearing protector" - with an NRR rating of 30. It also rates highly for comfort, noise suppression, and utility in a variety of noise environments. This earmuff is compact with soft, padded, adjustable headband and foldable ear cups. The cups have replaceable, snap-in foam ear cushions for comfort. The product sells for $23 on Midway USA. The Howard Leight Max Earplugs is "the highest rated disposable ear plug in the U. S.", according to Uline sellers. 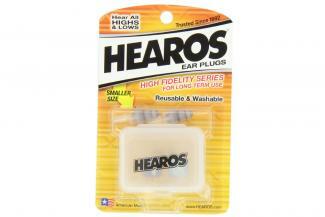 The earplugs are made of contoured, tapered polyurethane foam that fits snugly in your ear. They can be used in various situations in work industries, home projects, and recreation. The Howard Leight Max Earplugs have an NRR rating of 33. The earplugs in this version are attached to a cord, which allows you to hang them around your neck in between use for convenience. A box of 100 corded pairs sells for $31. The un-corded version sells for $33 for a box of 200 pairs. 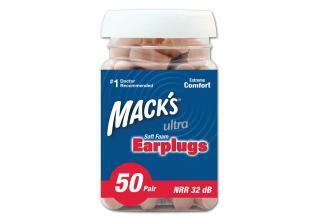 Mack's Ear Care Ultra Soft Foam Ear Plugs are rated the number one best seller in earplugs on Amazon. Reviewers rate these 4.3 out of 5 stars for comfort and effectiveness. This product is made of tapered foam for a comfortable fit and is economical at around $9 for 50 pairs. They have an NRR rating or 32 and cover range of noise hazards, from loud music concerts to power tools to range shooting. Hearos High Fidelity-Series Long-Term Earplugs is rated on Musician's Friend as "one of the best ear plugs for musicians and music fans." They are rated 4.4 out of 5 stars by reviewers on the website for ease of use, good function, quality, and clarity. The silicone flanged ear inserts are washable, reusable and long-lasting, These earplugs protect your hearing while still allowing you to hear the full range of music. You can purchase a pair for $10 from Musician's Friend. 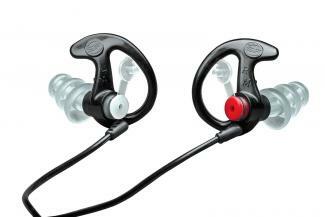 The Ear Pro By Surefire 4 Sonic Defender Ear Plugs are also flanged earplugs. Seventy-eight percent of reviewers on Amazon give the product 4 to 5 stars for comfort, fit, and protection. Reviewers mention using these earplugs for several activities, including gun shooting, motorcycle riding, racecar driving, and industrial jobs. Purchase the Ear Pro By Surefire for $11 to $42 from various vendors on Amazon. The triple-flange earplugs are made of soft polymer, and each fit into an over-the-ear retention ring that hold them in place. A lanyard holds the two ear pieces safely together. Noise reducing filters at the outside end of the device provide additional hearing protection. You can open the stoppers of these filters to hear background sounds. The 3M Banded Style Hearing Protector is a banded earplug. You have the convenience of hanging the band around your neck when you are not using the device. The washable, detachable, and replaceable semi-insert ear pods fit in the ear opening only, instead of in the ear canal. The majority of reviewers on Home Depot give this product 4 to 5 stars for its ease of use, convenience, protection, quality, and value. Reviewers describe using these for home projects and lawn care. 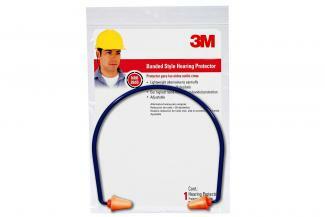 The 3M Banded Style Hearing Protector has an NRR rating of 28, and you pay around $7 for one pair. The Howard Leight - QB2HYG - Banded Earplugs is another choice of a banded type HPD. The detachable, semi-insert ear pods are washable and replaceable. The design of the band protects the ear pods from touching dirty spots when you set the device down. Google shopping reviews rate this product well for ease of use, convenience, and comfort. The product carries an NRR rating of 25 and is useful for when you are only exposed to intermittent noise. For $4 you get the full device plus a pair of replacement pods on eSafety Supplies. 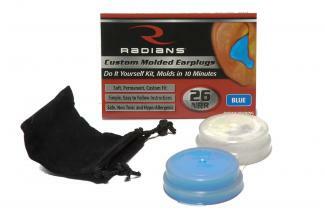 The Radians CEP001 Custom Molded Earplugs come as an easy, do-it-yourself kit you use to custom mold inserts to fit your ears. These earplugs are rated well by FullSource product reviewers for being easy to make, a good fit, and good functional noise reduction. The product is made of hypoallergenic silicone and is washable, reusable, and long-lasting. You can use it for a range of work, sports activities, lawn work, and do-it-yourself home projects. 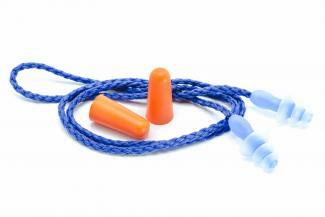 The NRR rating is 26, and the earplug sells for around $10 for a pair of molds. The best form of HPD for you is the one you will wear every time you should, and it fits in with your type of work, home projects, recreation, and your need for other safety protection on your face or head. The U. S. Occupational Safety and Health Administration (OSHA) workplace hearing protection regulations can also serve you as guidelines for selecting the best HPD for use at home or recreation. OSHA requires employers to provide hearing protection for all employees who are exposed to unsafe noise levels above 85 decibels during an eight hour shift - be it in manufacturing or construction. Noise protection at home and at recreation is as important as that at work. According to a Consumer Reports article, prolonged exposure to even MP3 players, hair dryers, or lawn mowers, as well music concerts, movie theaters, and sporting events can damage your hearing. As a useful reference, page 9 of an OSHA Pocket Guide for construction workers has a graphic of noise levels from work activities and every day sources that can help you select adequate hearing protection. Hearing protection devices come with a Noise Reduction Rating (NRR), as explained by Cooper Safety Supply. 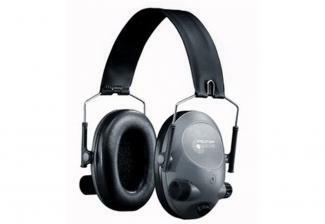 Your HPD should have an NRR that will reduce your inner ear noise exposure to below the OSHA safe level of 85 decibels. Ideal protection is between 75 and 80 decibels, according to a Washington Audiology review. Whether at work or play, it is important your HPD does not overprotect to lower than 70 decibels. This avoids the inability to hear important communications, warnings, and alerts in your vicinity, according to the review. Based on the NIOSH and Washington Audiology overviews, there are two main types of hearing protection devices - earplugs and earmuffs. At the same NRR rating, both types of HPD give similar hearing protection for a range of noise situations. One form might be more suitable for an intermittent or a prolonged type of noise hazard, or for an individual's preference for a specific device. Ear plugs are small devices that fit in and block the ear canal. They are well-suited for a full range of noise environments and preferences. They do not get in the way if you have to wear other safety gear, such as a helmet or forms of eye protection. 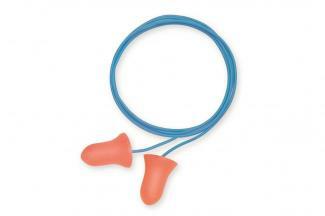 Soft foam earplugs fit into the ear canal and expand after they are rolled and inserted to fit and plug the ear canal. These inserts are inexpensive, disposable, and are well-suited for prolonged, continuous, high noise levels, such as a jackhammer at a construction site. Soft foam earplugs usually have higher NRRs. Custom inserts are plugs custom-molded to fit an individual's ear. 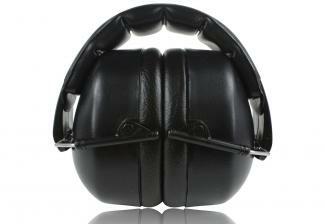 These are also easy to insert and are also suitable for intermittent noise protection. These are good for people who have difficulty inserting other types of earplugs, but the mold must be a good fit to be effective. They cost more than other ear plug devices but are reusable and last longer. They come in different sizes to fit most preferences. Some include electronics in the design that improve communication while reducing noise. 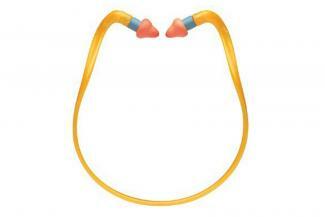 The ear cups are usually made of soft plastic with a foam or fluid filling and are held in place by headbands. Earmuffs are generally more durable than ear plugs, easier to use, and may offer a bit more protection in certain situations. Some earmuffs can be fitted to hard hats for convenience. Because they can prevent a good seal of the earmuff to the ear, people with beards, sideburns or glasses might do better with earplugs. Sometimes a combination of an earplug and an earmuff might be needed for situations where the noise level is high, or there will be prolonged exposure for eight hours or more. The combined protection adds about five decibels additional protection, according to Cooper Safety Supply. Use the best hearing protection device in every noise situation where your hearing is threatened, whether at work, home, or recreation. Choose an HPD that reduces the hazardous noise to a level recommended by the experts, one that fits well and is comfortable and convenient to use. For more information on hearing protection at work, consult your safety officer or additional NIOSH safety information.